The year 1926 marked the 150th anniversary of the signing of the Declaration of Independence. This sesquicentennial was cause for celebration throughout the country, and as would be the case fifty years later at the bicentennial, commemorative coinage was authorized and produced for the occasion. The Act of March 3rd, 1925 authorized a maximum of 1,000,000 commemorative silver half dollars to be produced, along with 200,000 gold quarter eagles. The latter would mark the first commemorative gold coinage since the gold coins produced for the 1915 Panama-Pacific Exposition, and would also turn out to be the last commemorative gold coin issued in the United States for more than sixty years. It should not come as a surprise that the 1926 Sesquicentennial Half Dollar had a very patriotic theme. The coins were designed by John F. Lewis Jr. and executed by John R. Sinnock, the latter who is generally credited with designing the Franklin Half Dollar. The obverse of the commemorative coin featured the conjoined busts of George Washington and Calvin Coolidge, both facing right with George Washington in front. The word LIBERTY is above the busts, with IN GOD WE TRUST in small print in front of the busts. Below is UNITED STATES OF AMERICA. This marked the very first and only time that a living President was depicted on U.S. coinage. The reverse featured the famous Liberty Bell, virtually identical to how it would appear on the Franklin Half Dollar a little over twenty years later. The dates 1776 and 1926 are next to it, and directly above it is the motto E PLURIBUS UNUM. The denomination is below, as HALF DOLLAR, and SESQUICENTENNIAL OF AMERICAN INDEPENDENCE is around the periphery, separated from the rest of the design by a thin line. The Liberty Bell itself is highly detailed, which has caused notable commemorative expert Anthony J. Swiatek to call it the first American coin with advertising on it, as the bell’s maker, Pass and Stow, is clearly visible on the coin. Since this is an integral part of the design (it is also readable on Franklin Half Dollars issued between 1948 and 1963) it was probably never considered to be advertising and if it did it never resulted in a public outcry, as a deliberate attempt to put advertising on a coin would probably have caused. 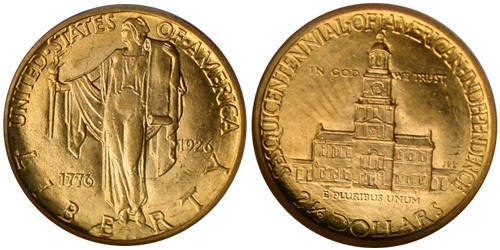 The coins were to be distributed at the Sesquicentennial Exposition (the official name was “Sesqui-Centennial International Exposition”) which was appropriately held in Philadelphia From May 31st, 1926 to November 30rd of the same year. The exposition was located in South-Philadelphia, and included a replica of the Liberty Bell which included 26,000 light bulbs, one of the largest pipe organs in the world and the Sesqui-Centennial Stadium, which would later be known as the John F. Kennedy Stadium. It would be one of the few lasting parts of the exposition, as it would stand until 1992 when it was finally demolished. The only true survivor is the Benjamin Franklin Bridge, a suspension bridge which was the first bridge to cross the Delaware River between Philadelphia and New Jersey and is an important route into Philadelphia to this day. The exhibition also featured educational exhibits, as well as a small amusement park. Despite grand initial plans for the exposition, it failed to draw a successful crowd and was considered to be a (financial) failure. The same can be said for the sale of the commemorative coins, which were available at the fair for $1 each. Despite approximately ten million visitors throughout the year (a much lower number than had been originally anticipated by the organizers) sales of the coins were much lower than that, with total sales halting at just 141,120 pieces. A total of one million half dollars had been authorized and struck at the Mint, and the remaining number of over 850,000 pieces were returned to the Mint and melted. The commemorative quarter eagles would reach total distribution of 46,019 pieces out of the 250,000 authorized. 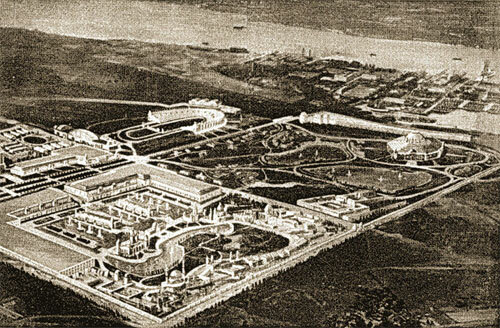 Now, almost 80 years after the exposition, the 1926 Sesquicentennial Exposition is largely forgotten. The Sesquicentennial half dollars and quarter eagles are one of the few reminders of the festivities held that year, and even the coins rarely attract much attention. The half dollars are among the least popular of the commemorative coins from the 1920s, and there is good reason for it. The design was executed in extremely shallow relief, which makes the coins look very unappealing, even when sharply struck. Many pieces have a dull gray look, and attractive, lustrous pieces are few and far between. 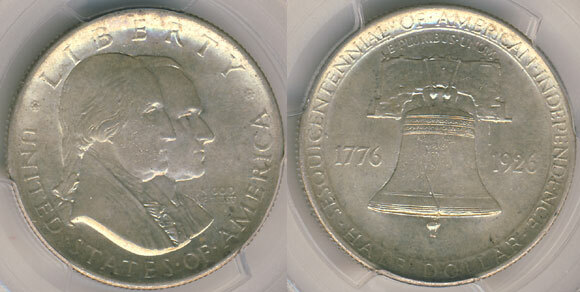 Most uncirculated pieces are among the lower mint-state grades up to MS-64, although even those are relatively scarce. Gems are very scarce, with a very low number of pieces certified by the major grading services. Anything that grades better than MS-65 is a major rarity, with perhaps only a dozen true MS-66’s known and nothing better than that certified by the major grading services.